Extensive user research was conducted on the high traffic/high value Product Comparison page. Results found that the comparison page played an integral role in the decision-making process for both new and existing users. 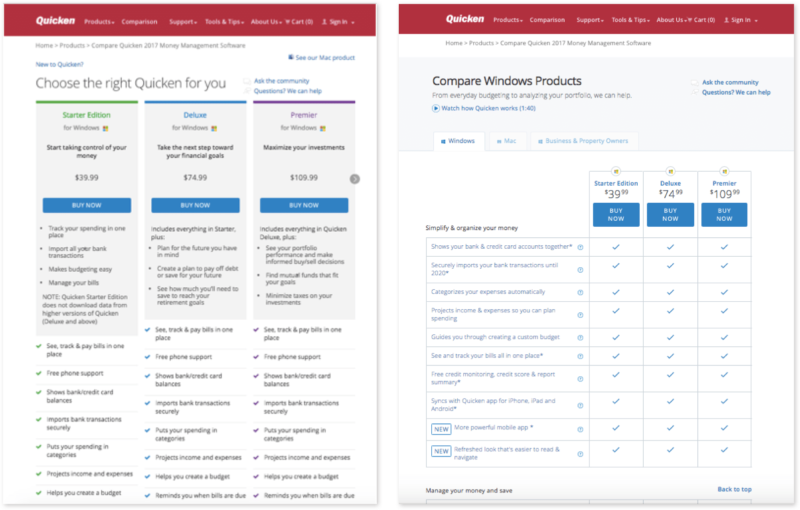 Looking to improve the matrix, and move more visitors into the purchase funnel, Quicken wanted to create a test variation for the Product Comparison page. With the holiday season fast approaching, Quicken wanted to launch, conclude, and implement the winning variation prior to Black Friday, when returning users receive a coupon for product upgrades. The urgency leading up to the holidays increased the temptation to prematurely implement the new variation to expedite the desired impact. The testing variation was created based on further rounds of qualitative studies. Quicken then worked with Blast to design and implement a testing protocol. To prevent prematurely determining a winner, the protocol guaranteed the test to run for two business cycles (two weeks), allowing each variation to gather enough conversion volume. This time frame also made it possible to account for varying visitor behavior during each day of the week. Result updates were provided at the end of each business cycle, rather than reporting on early test performance where conversions are low and external factors can’t be accounted for. With a significant amount of conversion volume during the first week, it would have been easy to rush to judgment. Instead, Quicken adhered to the testing protocol and let the test run for two business cycles. Looking at week over week data, there was clearly an unusual change in performance. Prior to determining a winner, it was important to identify what factors contributed to the Control doing so well in the first week, and the Variation ultimately doing better after two business cycles. Blast discovered a key insight in Quicken’s channel traffic. The difference in the amount of traffic coming from email during the first week versus the second week was significant. Historical precedent showed most visitors on Black Friday are existing customers, and their behavior would likely be similar to test performance in week one. Thus, Blast recommended Quicken retain the Control for the busy holiday season. It would have been a disservice to Quicken’s business to implement the variation based solely on overall test results. By diving deeper into the data, Blast provided key insights to make an informed business decision. Quicken agreed with Blast’s recommendation and decided to implement the “winning” variation in the future, when existing users have more time to acclimate to the new design.